Alleviating concerns the International Space Station could be temporarily abandoned late this year, the Russian space agency has set Nov. 12 for the next crewed flight of the Soyuz rocket after an unmanned launch of the normally-reliable booster failed last month. The Nov. 12 blastoff would come after at least one unmanned flight of the Soyuz rocket third stage responsible for an Aug. 24 mishap that destroyed a Progress cargo craft bound for the International Space Station. The next Progress spacecraft, the disposable vehicle's 45th supply run to the space station, is now scheduled for liftoff Oct. 30, according to Roscosmos, the Russian federal space agency. If that flight goes as planned, the next three-person crew will depart the Baikonur Cosmodrome in Kazakhstan on Nov. 12 heading for the space station. NASA astronaut Daniel Burbank and cosmonauts Anton Shkaplerov and Anatoly Ivanishin will fly aboard the Soyuz TMA-22 capsule for their long-duration mission on the orbiting complex. Burbank, Shkaplerov and Ivanishin had been scheduled to launch Sept. 22 before last month's Soyuz rocket failure. Space station commander Andrey Borisenko, Russian cosmonaut Alexander Samokutyaev and NASA flight engineer Ronald Garan now aboard the space station are scheduled to return to Earth on Thursday night. Three more residents will remain on the space laboratory until mid-November. The Nov. 12 launch date would allow the space station to remain partially-staffed with a crew of three until another trio of fliers blast off Dec. 20. That flight would restore the outpost to a full crew of six international astronauts and cosmonauts. Officials initially feared the space station may have to be temporarily abandoned if Soyuz rockets were not ready to fly by mid-November. After the retirement of the space shuttle, the Soyuz is the only vehicle capable to carrying astronauts to and from the station. The Aug. 24 Soyuz rocket anomaly was blamed on contamination inside a supply line leading to the gas generator of the booster's third stage RD-0110 engine. The gas generator powers the turbopump of the kerosene-fueled engine. Investigators concluded the defect was "random" and recommended more stringent quality control procedures. The engine responded to the problem with an emergency shutdown, and the rocket and Progress payload crashed in southern Russia a few minutes into flight. 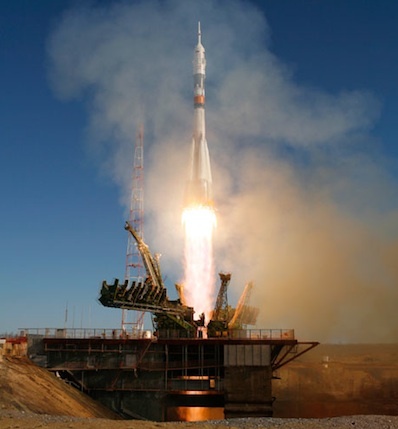 The failed Progress launch used the Soyuz-U configuration of the historic rocket, which has flown nearly 1,800 times since the dawn of the Space Age. 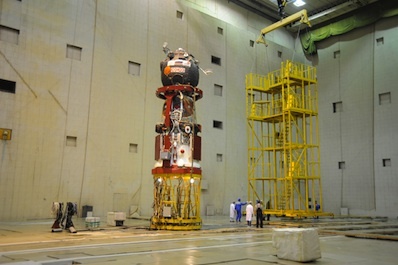 The Soyuz-FG rocket used on manned missions uses an identical third stage as the one at fault last month. Further Soyuz rocket missions will be cleared for flight after thorough inspections of hardware awaiting launch, according to Roscosmos. The launch of a Soyuz 2-1a rocket with six Globalstar commercial communications satellites is being delayed from early October due to the inspections, according to Globalstar. A report from the Interfax news agency said Russia tried to convince U.S.-based Globalstar to keep the flight on track for October, but the company declined in favor of additional quality checks.